Departure from Dolphins a ‘kick in the guts’ Brodie Cowburn brodie@baysidenews.com.au FORMER general manager of the Frankston Football Club Gary Buckenara said he is “bitterly disappointed” at the club’s decision to let him go on the eve of the 2019 VFL season. Buckenara was appointed general manager of the Dolphins in January 2017, and helped guide the club back into the VFL after they had their license revoked in 2016. On 25 March it was announced that they had parted ways. ...to find hidden vouchers starting from $100 to some of our amazing stores. drive. That’s the significant factor in the decision to move in this certain direction.” The Dolphins’ season begins this Saturday at home against Essendon. Geddes said that the club is “comfortable” with the decision to part ways with Buckenara so close to the first game of the year. “I guess the timing is something you’re never really in control of, things were working out differently than we had hoped and we had to make a decision. The timing is matter of history, and we’re comfortable with the decision,” he said. “We have got a process in place going forward. We’re comfortable we’ve got the system to maintain stability and steps forward in this difficult time. We’ve currently got people who have just stepped up and taken those roles but by end of this week we’ll have someone to take on an interim role as manager of the club. “On behalf of members, sponsors and stakeholders we would like to wish Gary all the best in his future endeavours.” The Dolphins’ season opener against Essendon will be played on 7 April at 2pm at Skybus Stadium. have grown by over 20 per cent.” “Providing a dedicated emergency department for children will enable the emotional needs of sick and injured children to be met and ensures they are protected from the stressful situations that occur in emergency departments. “This investment will improve the emergency department experience of children and their families, improve waiting times and ensure that children receive high quality care in the right place at the right time.” Frankston mayor Cr Michael O’Reilly said “improving the availability and accessibility of facilities and programs to support mental health and drug and alcohol dependent clients in the region is a priority of council and local organisations including Peninsula Health, Monash University Peninsula Campus, and Frankston Private Hospital.” “We continue to work closely with these key organisations and all levels of government to ensure the provision of services and programs meet the future needs of the community. Council thanks the Federal Government and Federal Opposition for their commitment towards delivering this ground-breaking service.” Dunkley candidate Peta Murphy promised $21 million towards the partnership if Labor wins government at the May election (“University and hospital team up for tests, The Times, 22/1/19). Building? Bring in your house Building? Bring in your house plans for a FREE estimate. plans for a FREE estimate. Call for for aa FREE FREE measure measure & &q quote. Call quote. SKM, which receives Kingston’s recyclable materials, and required cleanup works at the site. In the meantime, Kingston has been able to negotiate an agreement with an alternative recycling provider,” he said. “At first 20 per cent of Kingston’s recyclables were accepted, this was later increased to 70 per cent and now to 100 per cent, which is great news. Sadly, between mid-February to mid-March around 1300 tonnes of recyclable material had to be sent to landfill. Students get involved with environment week ENVIRONMENT Week at The Briars historic property, Mt Martha included activities and half-day programs for students in years 1-6. Schools could choose Engaging with Nature, Indigenous Connection to Country, Homestead Heritage and Sustainable Living with children exploring two areas in their chosen program. In Engaging with Nature, students took part in weaving and visited the Briars Nature Nook to check for birds, bats and wildlife in the nesting boxes, as well as read interpretative signs. On the wetlands boardwalk they stopped to explore the sounds, plants and animals, and observed and sketched birds with Birdlife Mornington Peninsula. Some got close to emus and wallabies. Local leaders explained Aboriginal culture while the students tasted bush tucker and gained insights into bush craft, language and community. Indigenous man Lionel Lauch shared his knowledge of food and fibre plants and wetlands flora. He led the children through the wetlands, while explaining how the plants are harvested and used for food, medicine and utensils. The Briars Homestead was home to the Balcombe family from 1846-1976 and students saw how life was then and now. They were shown how the family thrived in an isolated colony where “reduce, reuse and recycle” were commonplace. They visited the heritage vegetable garden to see pumpkins, carrots and strawberries grown organically then and now. Years 3-6 students explored the Eco Living Display Centre and learned about “living green”. They saw first-hand how they can reduce waste at home and learn about decomposition, and investigated what things can influence energy efficiency. Monash Prime Science Team hosted hands-on science activities to create and measure energy. Get closer to the heart of every conversation. Not only do conversations get easier with InseraTM hearing aids, everything sounds just the way it should. Whether it’s the music playing, or a friend’s voice across the room, you’ll know exactly where sounds are coming from and pick up on the emotional undertones that go with them. And that makes listening easier and more enjoyable. 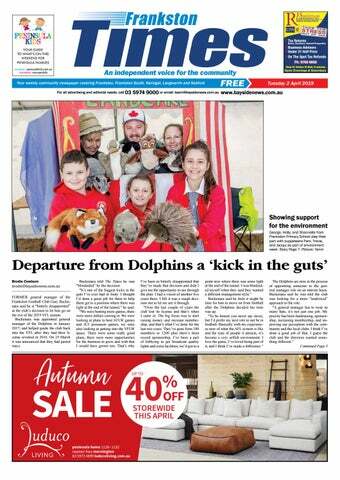 We are the only locally owned and operated community newspaper in Frankston City and on the Mornington Peninsula. We are dedicated to the belief that a strong community newspaper is essential to a strong community. We exist to serve residents, community groups and businesses and ask for their support in return. great for all kids from newborn right through to the end of primary school,” he said. “We’re running with a jungle theme this year, so make sure the kids are in their best jungle themed costumes for the chance to win a great prize. “We’ve got sports, face painting, interactive stage shows in the Party Play Pen, an animal farm and so much more, including The Kazoo’s live on stage. You’ll find more than 45 stalls with a whole range of information about children’s products and services within the local area.” The event runs from 9.30am to 1.30pm on 9 April. No pets will be allowed. Five of the Mornington Peninsula’s Port Phillip beaches are ranked in the top 10 for water quality by Environment Protection Authority Victoria. Top of the 36-beach list for having the best water quality over summer was Santa Casa, followed closely by Easter, The Dell and Portarlington – all beaches on the Bellarine peninsula. Portsea and Rosebud came in at equal five, up from eight the previous summer. Overall, water quality at the bay’s beaches was rated good throughout summer, except after large rain events which produced days when swimming should not take place. Brighton came in as the worst of 36 bay beaches checked by the EPA. The beach was adversely affected after a sewage leak in a nearby street which triggered poor water quality for seven days in a row. The EPA’s chief environmental scientist Dr Andrea Hinwood said water quality was “fairly even across locations”. “Whatever contaminants wash off the streets of Melbourne in a rain storm wind up in the bay, bringing with them the risks of infections, stomach upsets and skin irritation,” she said. Contaminants washing into the bay included animal droppings, litter, plastics, cigarette butts and detergents. “There are several things you can do about that: don’t litter, be careful what you allow to wash into the gutters and stormwater drains in your street and check the Yarra and Bay website before you hit the beach,” Dr Hinwood said. One other common cause of poor water quality is algae, which occurs naturally in the bay and varies according to conditions. “We advise people to avoid swimming near stormwater or river outlets for 24 to 48 hours after heavy rain, because that’s when animal droppings and other contaminants are washed into the bay from beaches and streets,” Dr Hinwood said. ALLEGATIONS that an electrician and apprentice were kicked off a work site in Frankston for not being union members will be heard at the Federal Court. The Australian Building and Construction Commission has begun legal proceedings against the Construction, Forestry, Maritime, Mining and Energy Union, alleging that two workers employed by a solar electrical subcontractor were prevented from working at the site of the Monash Peninsula Student Accommodation Project. The ABCC filed a statement of claim alleging that the two workers were approached by a CFMMEU official on 13 September 2018, who told them to get off the site when the workers revealed they were not part of a union. It is alleged the two workers were prevented from working on the site that day. The ABCC is alleging contraventions of the Fair Work Act. WHILE sometimes it doesn’t always appear to be a place for a leisurely swim, Safety Beach is in the top 10 beaches on Port Phillip for having good quality water over the past summer. Pet registration renewals for cats and dogs on the Mornington Peninsula are due by Wednesday 10 April. It costs $41.50 a year to register a desexed dog and cat. Discounts apply for pension card holders. The fine for not registering your dog or cat with the shire is $322. For first time animal registrations, once registration fees have been paid, pet owners are issued with a lifetime identification disc to attach to the pet's collar. Dog or cat owners should notify the shire of any change of address or if pet no longer lives with them or is dead at mornpen.vic.gov.au/ animalchanges or by calling 1300 850 600. To change a pet’s microchip details visit car. com.au/updating-registry-records Pet renewals can be done online, over the phone and in person. Details mornpen.vic.gov. au/petregistration. DISCOUNTERS We’ve got you covered! AN automatic number plate recognition operation resulted in three arrests on Frankston-Dandenong road on Monday, 25 March. The first arrest made as a result of Operation Kinetic was of a 48-year-old Carrum Downs woman at around 10.30am, who is alleged to have tried to avoid the site by doing a u turn. Carrum Downs police intercepted her vehicle and conducted a breath test, which resulted in a reading of 0.144. She is expected to be charged on summons with drive while disqualified, drink driving and fail to stop on police direction. Her car was impounded for 30 days. Shortly after police intercepted another driver after the number plate recognition system revealed they were driving with a suspended license. It is alleged that the 46-year-old Cranbourne woman gave a false name and address in addition to driving with a suspended license. She is expected to be charged on summons with state false name and address, drive while suspended and fail to display P plates. Her vehicle was also impounded for 30 days. A 50-year-old Frankston man also had his car impounded for a month after allegedly being caught driving with a suspended license. A woman has died after an alleged hit and run incident in Chelsea involving a cyclist and a ute on 28 March. The 50-year-old Chelsea woman was riding her bike along the Nepean Highway at around 5.40am when she was allegedly struck by a ute. Police allege that the driver of the ute fled the scene. A 28-year-old Parkdale man was arrested in Broadmeadows after his car was located in Seaford a little after 8am. He was charged with dangerous driving causing serious injury and failing to render assistance. Those charges are expected to be upgraded. The Parkdale man appeared in an out of session’s court hearing on 28 March. He was bailed to appear in Melbourne Magistrates’ Court on 1 August. CFA on scene THE CFA attended the scene of a fire at Barkala Court Frankston at around 9.30pm, 25 March. Police had been at the scene searching for a missing person when they noticed a wall was alight. The CFA was called and the fire was extinguished. Police said the blaze was non-suspicious. March. The youth is alleged to have taken cars between Dandenong and Safety Beach. They were charged with 31 offences, including two aggravated burglaries, three burglaries, eight offences related to theft of a motor vehicle and theft from a motor vehicle, fail to stop for police, and unlicensed driving. The four allegedly stolen vehicles were recovered. Bike chase TWO men have been arrested in Frankston North after a youth was chased on his bike and allegedly assaulted in a walkway off Mary Grove, Hastings, earlier this month. A 32-year-old man was charged with assault intentionally causing serious injury. A 40-yearold man was charged with making a false report to police and being an accessory after the fact. Witnesses wanted POLICE are investigating the assault of two cyclists who were struck on the back of the head by someone riding in a Holden Commodore on Cranbourne - Frankston Road, 19 March. The father and son were riding their bikes near Peninsula Link at around 4.15pm when they were struck by a passenger of the Holden Commodore with an unknown object. The vehicle was seen turning onto McLelland Drive Langwarrin. Any witnesses are encouraged to call Senior Constable Humber at Carrum Downs Police station at 8770 4110. Upcoming changes to Frankston line Level crossing removal works are progressing along the Frankston line in Carrum. To allow for these works, changes will be in place that will affect the way you travel. Translation service – For languages other than English, please call 9280 0780. Please contact us if you would like this information in an accessible format. Gas delivery: An artist’s impression of the floating gas processing terminal and a tanker used to carry liquified natural gas from overseas to Crib Point. for Flinders, Nathan Lesslie, said that “without the environment, no other life can exist. Therefore, the environment should in my opinion be considered the most precious of all things”. JAZZ AND THE SILVER SCREEN Friday 3 May, 10.30am & 1.30pm Showcasing jazz classics and selections from eclectic and celebrated film scores, Hook Turn Orchestra presents evocative music that sprang to life on the silver screen. National Seniors Of Australia NSA is a friendly group of likeminded people who meet each month for chit chat, speakers and general information about wellbeing. We are a non-political group who enjoy outings and special days. The meetings are held on the last Wed of the month at St. Francis Xavier Church hall, Davey St, Frankston begins 10am but tea and biscuits available from 9.30 onwards. Further details Marion 0425704481. Alcoholics Anonymous - Mornington Peninsula Do you need help to stop drinking? You’re not alone, contact us now on our 24 hour helpline 1300 880 390 or find a local meeting at www.aatimes.org.au/meetings Indoor Bowls Over 55s club Frankston East 200 Beach St. Frankston Indoor carpet bowls every Saturday and Tuesday from 12.30 to 3pm. Free tuition ring Betty 97897275 JP Locations National & International documents inc affadavits, stat decs & cert copies signed FREE of charge at police stations on the Peninsula. Frankston weekdays 10am to 3pm. Mornington: Mondays & Thursdays 11am to 2pm. Rosebud: Mondays & Thursdays 11am to 2pm. Carrum Downs: Mondays & Thursdays 5pm to 7pm. Hastings: Wednesdays 5pm to 7pm. Ph1300365567. Little Hands Playgroup For ages 0-5, Tuesday mornings during term time. No cost, bring a snack, come and play! Contact playgroup@frankstonbaptist.com.au Mornington Peninsula Astronomical Society Public Stargazing Hear inspiring talks, view stars, planets, clusters and galaxies through our powerful telescopes at 8pm on the 1st Friday of every month at The Briars dark-sky observatory. Melway ref 151 E1. Bookings are essential. Small fee payable. Details www.mpas.asn.au or phone 0419 253 252. Find us on Facebook www.facebook.com/mpas0/ Volunteers Wanted Enveco Health is an innovative social enterprise aiming to assist those with mental ill-health live independently in the community and to recover in a supportive non-clinical environment. We’re currently seeking volunteers to get involved in this innovative project. If you would like to know more visit www.enveco.org.au, and send us a message. Frankston CWA Wed 17 April from 1.30pm 88th Birthday Celebrations with a lovely High Tea at 33 Beach St, Frankston. Cost $ 20 per person. To book phone 9783 8936 Woodturning Exhibition 16 -19 May, 10am – 4pm The Peninsula Woodturning Guild exhibition held at McClelland Sculpture Park & Gallery, 390 McClelland Dr, Langwarrin. Woodturning demos. Free entry, ample parking. Shire to clamp down on overdue rates Compiled by Cameron McCullough THE sum outstanding in the Shire of Frankston and Hastings for arrears of rates totals something like £800. At last Thursday’s Council meeting it was decided to get this amount in without further loss of time. Defaulters are given 14 days in which to pay up, failing which legal proceedings will be instituted. Ratepayers, who through carelessness or oversight have neglected to pay their rates, would do well to communicate with the shire secretary immediately. *** ATTENTION is directed to the advertisement of Mr M. L. Goulding appearing in another column. Mr Goulding, who saw active service with the 58th. Batt. of the A.I.F. has taken over the garage adjoining the Pier Hotel, Frankston, where motor cars may be hired at reasonable rates. The requirements of motorists will also be attended to with promptitude and efficiency. *** MANY admiring glances were directed to the 35 h.p, “Itala” which Mr Bradbury, the manager, installed in the Company’s garage at Frankston this week. The car is a superior class of Continental make. It presents a very handsome appearance, and has the advantage of being able to seat seven persons comfortably besides the driver. *** PROTESTANT Federation. Under the auspices of the Frankston branch a public meeting will be held in the Mechanics’ Institute next Friday evening, when the Rev. Hugh Kelly will speak. witness stated that she earned money of her own by keeping boarders. Her people also gave her money. Wm. Southan testified to the fact that he gave the cow to claimant. Thomas Bineham, the defendant in the original complaint, said he had no claim on the property in dispute. At the time the sulky was bought by him for his wife, witness was an uncertificated insolvent. The Bench said that on the evidence the claim must be allowed. Mr Utber’s application for costs was refused. *** Heard in the Train THAT Seaford is crying out for “more light.” That Hastings says it wants the same commodity - only more so. That Frankston could do with a few more lamps this winter. That footpaths in Frankston could do with a top dressing of gravel. Miniature lakes are alright in their place. That some of the side walks leading to the railway station are in a bad way after an hour’s rain. That the Military officers who recently inspected the junior cadets at Frankston State School said the boys had the best teeth they had examined. That our soldiers, in embryo, are now prepared to chaw up all before them. That a group of citizens discussing the position the other night agreed that there was a great future ahead of Frankston. That the future is ahead alright - always had been - but only a few are trying to overhaul it. Too many are satisfied with the present. Puzzles supplied by Lovatts Publications Pty Ltd www.lovattspuzzles.com See page 21 for solutions. Have you made your next GP appointment before the busy season? NEPEAN Hearing is offering free hearing tests and rating your Hearing for Your Age (for the over 40’s). The number of Australians who are hearing impaired is increasing because of • the Ageing Population –we are living longer • excessive Noise - in the workplace and high level music Hearing loss is often described as the ‘invisible disability’. People often wait for 5-10 years before they seek help. Hearing loss may also be a contributing factor in the speed of onset of dementia. The degree of For your convenience, book your next appointment online Nepean Hearing is an loss is also correlated to the risk of independently owned clinic and Alzheimer’s disease. It is important and use our self check-in kiosk at your clinic the audiologists are University of to know about your hearing. Melbourne trained. Many people ignore the signs of For hearing screenings our main hearing loss, which include turning office is located across the road from the TV or stereo up so loud that Frankston Hospital at 13 Hastings others complain, frequently needing Medical Centre Medical Centre Medical Centre Road, Frankston, phone: 9783 7520. to ask others to repeat themselves and We are also located at: not being able to hear properly on the www.bpmc.com.au www.humphriesroadmc.com.au www.rhmc.net.au Camms Road, Cranbourne, telephone. is also DOCTORS at171 Towerhill Medical Centre located 266 Seaford Road 265 Humphries Road 129 Shoreham Road Constant ringing phone: 5966 1117, and another warning sign of hearing loss. Seaford 3198 Frankston South 3199 Red Hill 3937 at 143 Frankston Flinders Road Frankston, have Hastings Community Health As technology advances, many P: 9786 4866 P: 9787 4266 P: 5989 2077 been from providing care and established 185 trusted High Street Hastings, people with hearing loss benefit phone:to 97837520. hearing aids. These innovations have services medical the people of the MorningTake advantage of the free hearing made a positive differenceton in the way Peninsula for over 70 years. test offered by Nepean Hearing to they can communicate and enjoy Towerhill Medical Centre (TMC) opened in ensure your hearing is at its optimum. their lives. WESTERNPORT MOBILITY We’re local and we come to you! meet your requirements while giving your feet great comfort. These Australian designed, high quality leather shoes ensure good foot support with a rubber arch support, padded foot bed with shock absorbent cushioning and effective heel counter with durability and great look. The Via Nova range offers colourful comfort walkers to fantasy footwear whatever your occasion or foot support needs. Bayside Shoes is located at 103 Railway Parade, Seaford on the corner of Clovelly Parade. Contact details are Telephone 03 9785 1887 and view our range of shoe options on www,baysideshoewarehouse.com.au. Trading hours are 9am to 5.30pm Monday to Friday and 9am to 3.30pm Saturdays. On Your Feet All Day? You Need Via Nova Lite. Designed For Your Health And Comfort Nova Lite Shoes offer a Level of Comfort and Support Unsurpassed In The Footwear Industry. Nepean Hearing is an independently owned clinic and the audiologists are University of Melbourne trained. For hearing screenings our main office is located across the road from Frankston Hospital at 13 Hastings Road, Frankston, phone: 9783 7520. We are also located at: 171 Camms Road, Cranbourne, phone: 5966 1117, and Hastings Community Health 185 High Street Hastings, phone: 97837520. Take advantage of the free hearing test offered by Nepean Hearing to ensure your hearing is at its optimum. Did you know that many audiologists are not independent, and rely on commissions from only one supplier? During Seniors Week 15% discount on our hearing aids for self funded retirees. DeckSeal specialize in the restoration & preservation of timber decks. Our services extend to timber screens, benches, boxes, cladding, doors, windows & also concrete cleaning & sealing. section of Network ClassiďŹ eds. General Carpentry Work, Renovations, Locks and Doors Fitted, Pergolas and Decks. General Repairs. No job too small. Free Quote, prompt, reliable service. Discount for Pensioners. Seaford Air Conditioning FAST, FRIENDLY SERVICE! Continually delivering a beautiful & long-lasting deck surface. We do it all from deck sanding, cleaning and sealing through to timber maintenance. Residential & Commercial. MOBILITY SCOOTER 4 wheels, 4 month old batteries near new, $300. Seaford. Ph 9782 4359. Trades & Services section of Network Classiﬁeds. BASECAMP On site van with annexe and sunroom, fully furnished. At Western Port Van park Somerville a seniors park for 50 + in quiet bushland setting next to Yaringa Marina. $80,000 ONO. To arrange inspection phone/text Eileen 0412 856 677 or 0408 381 918. JAYCO HAWK Campervan. Second hand, in good condition, 3 way fridge, gas/electric stove, queen & double beds, reg (T18-470 ). $14,000 Neg. Phone: 0411 472 362. Each month the Frankston Times will run a Community Events page, where your school or organisation can promote upcoming events, fund raisers, social events, etc. at no charge. 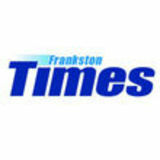 This page is sponsored by Frankston Arts Centre, and listings are completely free. Lisiting should be about 40 words and include event name, date, time & address. who will do battle at Lloyd Park. Crib Point host Rye on Saturday, while Pearcedale hosts Devon Meadows and Somerville hosts Seaford. On Sunday Hastings will kick off their season at home against Tyabb. Off the field Pearcedale were the big winners of the week, securing the signature of former Essendon and St Kilda star Brendon Goddard. He will play for the club in a one off match against Chelsea on 18 May. Pearcedale continue their tend of bringing in big names, last year bringing in Drew Petrie for a one off appearance, and the year before signing Barry Hall. By Brodie Cowburn DIVISION One football will kick off on Saturday in the MPNFL, with a clash of the titans between Frankston YCW and Sorrento the headline act. The two powerhouses will do battle at John Coburn Oval, with the Stonecats looking to make amends for a 2018 season that ended in unexpected disappointment. YCW were ravaged by injuries last season, and will welcome the chance to start afresh. their quest to go back to back. The small forward plied his trade with Richmond and North Melbourne at AFL level. Dromana will be making their division one debut after a big grand final win last season in the second division. The Tigers will take on Rosebud at Olympic Park, a big road trip for their first battle. Rosebud were poor in 2018, but have a big chance to start anew under the watchful eye of new coach Nick Jewell. Edithvale-Aspendale kick off their 2019 campaign with a tough task against Mornington, who showed plenty of promise last season and will be looking to make finals this time around. Edi-Asp struggle badly in front of goal last season, which eventually cost them despite performing well in other parts of the ground. At Greg Beck Oval Frankston Bombers will take on Bonbeach, who will be looking to improve on a disappointing 2018.
quickly set up teammate James Hammond on the left of the Pines area only to watch in dismay as Hammond blasted his shot well over. Former Dandenong Thunder, Berwick City and Langwarrin midfielder Sergio Yanez had come on at half-time and was to have a major influence on this contest. As a 19-year-old Yanez spent a year playing in Chile but partway through last season job commitments forced him to stop playing when at Langy. His close control is excellent as is his ability to quickly change direction but it was his ball striking ability from set pieces that brought Pines back into this contest. In the 64th minute Yanez took a freekick 35 metres from goal and Bayside custodian Lewis Cotsopoulos was at full stretch as he tipped the ball wide. Cotsopoulos was in the thick of the action again in the 72nd minute after Negassi sent Joe O’Connor clear on the left of the area and his firm drive was parried wide by the Argonauts shotstopper. A minute later Bailey Atkinson gave the ball away but Dainty failed to punish the Pines right back. Beaumaris midfielder Dicken had been involved in some verbal stoushes prior to being booked for dissent and a few minutes later he booted the ball away after a decision had gone against Bayside leaving referee Tim Dimitriu with little option but to give Dicken a second yellow card then the mandatory red. Pines didn’t need an invitation to surge forward and wave after wave of attacks were repelled by the Bayside defence. But with just two minutes left of normal time Pines won a free kick about 25 metres from goal. Yanez stepped up and his bludgeoning strike skimmed off a defender and went in off the inside of the far post to give Pines a lifeline. with a bullet-like header from Callum Richardson following a Damian Garcia corner. Great set-up play by Richardson in the 11th minute was rewarded with a classy finish by Pagliarulo and four minutes later a Charlie Conrath cross allowed Bjorn Kutschera to round Knox keeper Siamak Bayatt-Torr to make it 3-0. Knox came back into the contest but two excellent saves by Somerville keeper Francis Beck maintained the margin. However Beck was helpless to stop a firm header from Nic Haddad following an excellent Robert Taylor cross and it was 3-1 at the interval. The second half was all about “Pags” as the big Scot added another three goals to his tally, the first from the penalty spot after Richardson was fouled in the 47th minute. In the 57th minute Pagliarulo’s cross was hammered home by Richardson and “Pags” nailed his hat-trick in the 70th minute when he got onto the end of a Carlo Cardoso cross. “Pags” rounded off the scoreline and finished off Daniel Hodge’s good work in the 81st minute with a left-foot strike into the far corner to complete his haul. In other State 5 matches Rosebud and Tullamarine settled for a 2-2 draw at Olympic Park on Saturday while Aspendale Stingrays lost 2-0 away to Pakenham United. Chris Parry and Beau Sharpe scored for Rosebud while the Stingrays’ best were Pat Diakgeorgiou, Jack Lindsay, Kieran Hughes and Sam Timuska Carr. This weekend’s league games: FRIDAY, 8.30pm: Mornington v Casey Comets (Dallas Brooks Park), Monbulk Rangers v Peninsula Strikers (Monbulk Regional Soccer Facility). SATURDAY, 3pm: Southern Utd v Senior NTC (Monterey Reserve; under16s 11.30am, under-19s 1pm), Ashburton Utd v Skye Utd (Ashburton Park), Whitehorse Utd v Frankston Pines (Terrara Park), Dingley Stars v Seaford Utd (Chadwick Reserve), Rowville Eagles v Baxter (venue TBC), Aspendale Stingrays v Tullamarine (Jack Grut Reserve), Rosebud v Casey Panthers (Olympic Park), Somerville Eagles v Old Mentonians (Tyabb Central Reserve). SATURDAY, 7pm: Goulburn Valley Suns v Langwarrin (John McEwen Reserve, Shepparton). Pennant Tennis Grade 1 returns to the Peninsula: Tennis Victoria Pennant is Australia’s largest inter-club competition and marks its 136th consecutive year in 2019. This year the Mornington Peninsula will be fielding a Pennant Men’s Grade 1 Team representing Ranelagh Club for the first time in close to 20 years. Daniel Byrnes, head coach at Ranelagh Club, will be the number one player. Commencing 27 April and every second Saturday at Ranelagh Club you will see the best of Victorian tennis players. All welcome to watch and support the Mornington Peninsula tennis team. Specials valid: 1 April to 14 April 2019. Conditions apply, while stocks last.